I am absolutely overjoyed to welcome Carolyn Jenkinson to the Equi-libre Horses (ELH) team as an official ELH Associate Trainer. Carolyn is a like-minded professional who has been studying with me for many years now. She has been a Member of The Academy since it’s formation and has worked very closely with me since then. Carolyn is based in Dorset, UK and has a wonderful history of riding and training experience. Over the last 5 years, she has immersed herself completely in both equine-centred horse care as well as the ELH application of positive reinforcement training with equines and has shown exceptional enthusiasm, dedication and skill at applying my work to both her own horse Jos and others. The results speak for themselves! From now on, Carolyn will be more involved with all the Academy courses and we will be working alongside each other to bring positive reinforcement training, education and inspiration to horse owners all over the world. I am extremely excited to be welcoming her into the team! Thank you so much for this opportunity Jo – I am so looking forward to the future alongside you in the Academy. Like so many of us my interest in horses was fuelled as a child – not least by the fact that riding and horse care was on the curriculum and both boarding schools I attended had their own horses and yards. What may have started as a way of getting out of the classroom, soon became an all-consuming passion and I left school as soon as I could to take a working pupil residential position at Fulmer International School of Equitation. It was there that I immersed myself in dressage the classical way under the careful tutelage of the late (and great) Robert Hall and his team of fabulous instructors. When the yard sadly closed down, I spent a short time working at a holiday trekking centre in Wales but before long I returned to following my passions at The Wellington School of Riding where I trained with Neredie Goodman and her team resulting in passing my BHSAI exams. I then left the UK for a stud farm in Mullingar, Southern Ireland – this led me to meet Gisela Holstein (international dressage trainer, List 1 dressage Judge, coach, and author). Due to a young eventer we were bringing on needing more structured schooling, I stayed there and spent two years furthering my knowledge within dressage as well as giving lessons to children and beginner riders. After a break of 25 years I returned to horses, taking lessons at Kingston Maurward Equestrian Centre before buying my own horse. The horse world had changed a lot during that period so on my return, I spent time exploring various trainers and trying out their programmes including Natural Horsemanship. 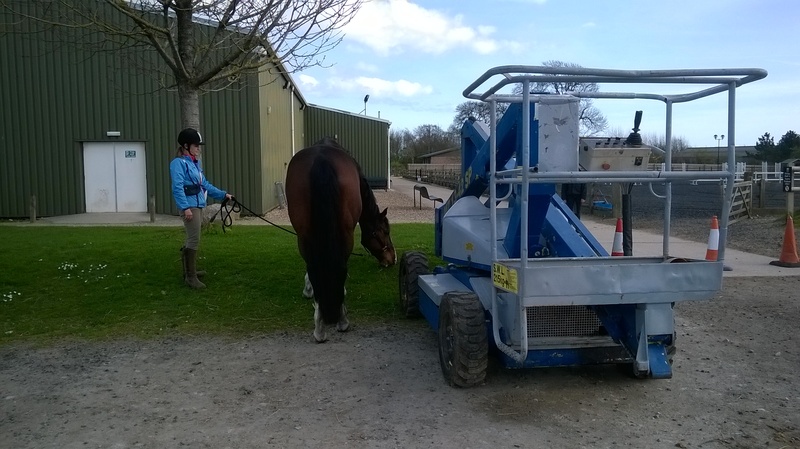 That path led me to discovering clicker training and I was quickly hooked on how positive reinforcement training encompassed the emotional and physical welfare of the horse – and I have to say my horse agreed with my choice too! I joined various online groups that Jo was also a member of and eventually met her in person when she gave a lecture at the first ever Equine Clicker Conference in 2012. We continued to stay in touch and I then began to study with her as my mentor and teacher because I just loved her passion and the level of detail within her work. 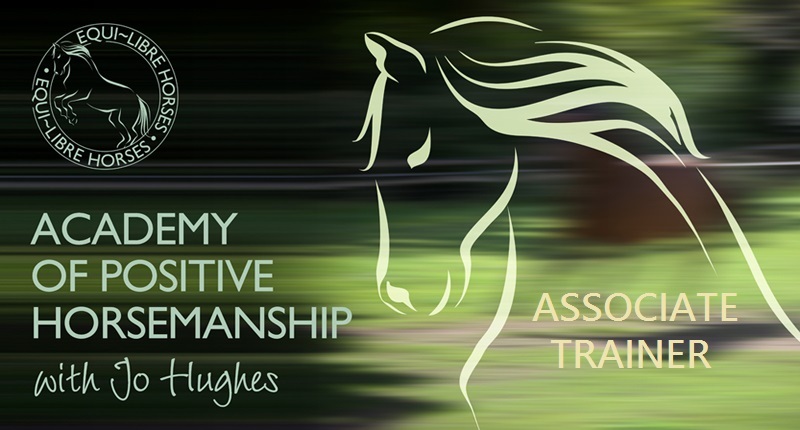 I joined the Academy of Positive Horsemanship at its inception and have been on a fabulous journey since then with helping my horse to change his emotional associations surrounding everything to do with groundwork and riding. I studied and worked through the Foundation Basics Tutorial Bundle along with the Basic Handling and Groundwork bundle and in October 2015 completed the How Horses Learn, Feel and Communicate course including the practical application of SD&CC protocols. I have also completed the levels of Jo’s Straight and Supple course – our positive reinforcement training within groundwork and ridden training has transformed beyond my wildest dreams. In addition, for my own self directed learning I took the Oplex Careers Level 3 award in Equine Behaviour and Psychology achieving a Higher Distinction and I also have also given short guest lectures for students at the college on Learning Theory with a focus on positive reinforcement. I am really looking forward to this next stage on my journey as an Associate Trainer whilst continuing my studies with Jo and sharing knowledge with all the Academy Members.